Thank you USCIS for posting a complete transcript of the USCIS Meeting with IIUSA on October 5, 2018. Such transparency is so helpful. Program integrity suffers from general lack of information, and from the industry’s inclination to promote asymmetry for what little info is given. At the meeting, USCIS Director Cissna spoke about current developments in EB-5, IIUSA representatives described areas of concern for the industry, and new IPO Chief Sarah Kendall commented on IPO performance. Regulations: Director Cissna, speaking in October, did not make it sound as of the EB-5 Modernization regulations (regarding investment amounts and TEAs) were on the brink of finalization. He said: “So on the main one, the proposed rule that has yet to go final, it is going to go final. We’re just not ready yet. We’re still working on it. You might have seen, I testified in front of the Senate a few months ago, back in June, and I got screamed at because Senator Grassley was wanting that regulation to be final even quicker. So I told him what I’ll tell you is the answer hasn’t changed. We are going to finalize it; just we’re not done yet. It’s a lot of work to finalize a regulation. But that should come soon.” And then later “Well, I think, I mean, you asked, you know, what are our priorities for the next fiscal year. I think, you know, putting aside the regulations which we already discussed, I think the main one is continuing to ensure the integrity of the program. That’s what it’s about. The reg., it might take a while yet before it gets finally published.” This is a grain of salt to go with the “last chance in November 2018” marketing pushes currently fueled by the OMB Fall 2018 Unified Agenda, which estimated 11/00/2018 for a final rule. Redeployment: IIUSA representatives spoke strongly for the need to clarify policy around redeployment. USCIS sounded receptive but vague — not as if they are currently working on redeployment policy. Kathy Neubel Kovarik, Chief of the USCIS Office of Policy and Strategy, threw out a couple ideas: that the industry might submit suggestions for how to clarify the policy, and what if USCIS published the details of approved redeployments for industry reference. IIUSA pointed out pros and cons. I will report further when IPO Chief Sarah Kendall speaks at the AILA/IIUSA conference in Chicago next week. I’m behind in reporting on litigation and enforcement actions in EB-5, but Friedland and Calderon have picked up the slack with a paper analyzing the couple SEC actions and flurry of investor-initiated litigation this year. Here is their helpful introduction to the paper. In December 2017 when we released the first edition of “Understanding EB-5 Securities: NYU Stern Database of SEC EB-5 Securities Enforcement Actions,” we were skeptical as to whether there would be sufficient developments in this area to justify annual updates. However, any doubts were removed during the first 10 months of 2018. Below is a link to our latest paper, entitled “EB-5 Securities – New Developments and Updated NYU Stern Database – 2018 Edition,” with the updated database as an appendix. The EB-5 Regional Center Program authorization is now extended to December 8, 2017 thanks to H.R.601, which the President signed into law yesterday. Washington worked with admirable dispatch this time, cutting and finalizing the deal all within one week and nearly a month ahead of the September 30th deadline. The language in Section 106 is a good reminder that “extended to December 8” doesn’t mean “guaranteed to remain unchanged until December 8.” Congress will reportedly turn its attention to immigration issues in the next couple months, and they could come up with legislation before December that affects multiple visa categories including EB-5. I’m not sure what changed, since I don’t work directly with I-924A, but yesterday USCIS published a new version of the Form I-924A Filing Tips page. When the SEC files a complaint, it’s easy for the public to just assume that the defendant is guilty as charged and there won’t be any more to the story but determining punishment. Even worse, USCIS tends to assume this and has been known to deny and revoke investor petitions and terminate regional centers before the SEC cases are concluded. We all need to remember that sometimes the defendant might have a compelling other side of the story, and might not be found guilty. The district court judge overseeing a recent EB-5 case filed by the SEC just found that the SEC “in numerous instances has not presented fully developed arguments to show why defendants’ actions violated securities laws.” The judge’s memorandum opinion, which considers the defendants’ side of the story, is linked at the end of the article Senior living developer avoids EB-5 ban, receivership (September 7, 2017). For the SEC’s version of events see SEC v. Seyed Taher Kameli, et al., Civil Action No. 17-cv-04686 (June 22, 2017). The article SEC Suffers One of its First Major Losses in EB-5 Realm (September 12, 2017) summarizes the issues. 2018 Update: The SEC v. Kameli case continues, however. The SEC came back with an amended complaint filed on January 29, 2018. The webinar was technical and specifically focused on Form I-924A — what’s new in the December 23, 2016 version of the form, and how to complete it. A couple points of general interest came out in the presentation. The presenter highlighted the expanded definition of regional center “principal” in the new I-924A and additional information requested about principals. The presenter confirmed that the IPO Compliance Division plans to use this information to conduct background checks of everyone in a position to control, influence, or direct the management or policies of the regional center, and that the results of such background checks are material to the regional center’s ongoing designation. 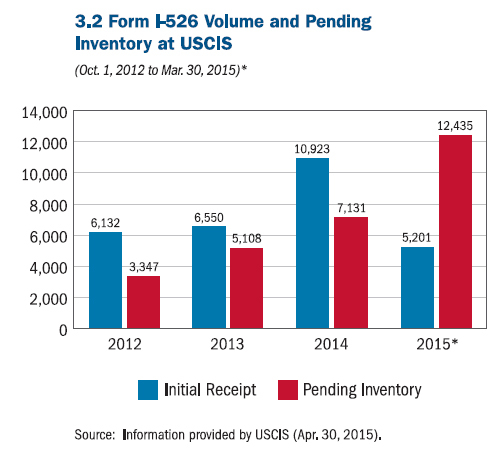 USCIS instructed that petitions that were withdrawn should be reported as “denied” on I-924A. This categorization could explain the petition approval and denial statistics published last month by USCIS, which reported a surprisingly high number of denied petitions. A caller encouraged USCIS to consider recording withdrawn and denied petitions as separate categories, and the call presenters said they’d consider the suggestion. The presenters also indicated that regional centers can add a note to I-924A explaining how many of the “denied” petitions were in fact denied, and how many withdrawn. The Semiannual Regulatory Agenda published today by DHS lists regulation 1615-AC07 (the EB-5 regulation concerning TEAs and investment amount increases) as being in the “Final Rule” stage. The timetable on the rule’s summary page gives an estimated date of 04/00/2018 for Final Action. I’m not sure how seriously to take the agenda or the date estimate. Developer FAQ: Jim Butler of JMBM Global Hospitality Group has put together a booklet titled The Developer’s EB-5 Handbook for EB-5 Construction Financing. Although targeted to hotel developers, this free booklet provides experienced answers to a range of practical questions common to businesses as they first consider EB-5 financing. Large-Scale EB-5 Real Etate Projects: Gary Friedland and Jeanne Calderon of the NYU Stern Center for Real Estate Finance Research have released a new paper featuring a database of large-scale real estate projects that incorporate EB-5 into the capital stack. See EB-5 Projects Database: 2017 Supplement with Trends and Observations (August 16, 2017 Draft). This 2017 database collects publicly-available information on 26 projects in major metro areas with current/recent EB-5 raises. The authors previously published a 2016 database with 27 projects and a 2015 database with 25 projects. These large-scale projects are significant for the industry because they target such a large number of investors. The 26 projects in Friedland & Calderon’s 2017 database aim to attract 6,736 EB-5 investors, which means that they alone could use up over two years of available EB-5 visas. Megaprojects take a large piece of a small pie, are too big to fail, can offer attractive and well-managed investment opportunities, and present a public relations challenge. A high-profile luxury development in a Tier 1 city is not typical of the EB-5 program overall, but it is typical of the few projects that seek and find hundreds of EB-5 investors. Vermont: Speaking of too-big-to-fail, I continue to follow the efforts of Vermont Regional Center to clean up from fraud charges against a couple of its project managers. The regional center has worked hard to recover from the disaster and (at least recently) to protect and compensate investors, but now faces having to respond to a NOIT from USCIS. A Notice of Intent to Terminate is not the same as a termination notice (the RC has a chance to respond to a NOIT, and not all NOITs are followed by termination), but it is a significant development. This news story discusses the whole situation, and this story gives detail of NOIT content. “What level of oversight are regional centers responsible to provide?” is a grey area question in EB-5, and a question that USCIS addresses in its assessment of Vermont Regional Center. Recall that Wednesday June 28 is the last day to submit comments responding to USCIS’s new policy language on redeployment I appreciate the AILA Comments on the Policy Manual, which explain where the policy goes wrong in imposing an “at risk” requirement after jobs have been created. IIUSA issued a legislative update on June 22 that comments on draft bills from Senator Grassley/Leahy and Senator Cornyn. I appreciate IIUSA’s thoughtful analysis, and its difficult position when it comes to commenting on contentious issues. The Cornyn bill would make everyone in EB-5 happy by clarifying that investors only (not investors plus family members) should be counted toward the annual EB-5 visa quota. Its TEA proposals would create winners and confirm losers – the winners being projects in rural areas and on closed military bases (which would be incentivized with new visa set-asides) and the losers being projects in distressed high-unemployment urban areas (which would only get 13.5% discount from the standard investment amount). To be fair, the Cornyn proposal would make projects in distressed high-unemployment TEAs slightly more viable than they are currently, since 13.5% is better than 0% — the effective investment threshold differential if projects not in distressed areas can also get TEA designation. But overall the TEA proposal looks designed to support the status quo, with a large percentage of EB-5 investors going to projects in prosperous urban areas and closed military bases. NYU Scholar-in-Residence Gary Friedland, Esq. and Professor Jeanne Calderon, Esq. have expanded their analysis of paths to TEA reform and other questions in the paper EB-5 Prescription for Reform: Legislation or Regulation? (Draft 6/19/17). The authors review perceived problems in the structure of TEA incentives, summarize proposed changes, and suggest that USCIS expedite reform by finalizing regulations, which could prompt the industry to unite in supporting comparatively moderate EB-5 legislation. The authors throw down a gauntlet by arguing that allocating 100% of job creation by an EB-5-funded project to EB-5 investors overstates the economic impact of EB-5 capital. They clarify that they do not challenge USCIS’s job credit methodology, but only question citing USCIS job credit methodology as evidence of EB-5’s economic impact. This is a helpful distinction, but I don’t see reformers in Congress accepting it, or liking the idea that EB-5 investors might get credit in practice for job impacts not supported in theory. The industry needs to take up the gauntlet, and explain (preferably with reference to economic theory, practicality, and other programs that require job creation) why and how EB-5 job counts and allocations make sense. After receiving many error reports, USCIS pulled down their logs of EB-5 petition approvals and denials by regional center. I hope that the logs will be reposted soon with corrections, and in the meantime we can prepare to interpret the data. A natural conclusion could be: if X Regional Center has had many investor petitions approved, then it must be a reliable regional center with happy investors. Coincidentally, I heard in the same week that New York City Regional Center ranks #1 among regional centers for number of I-829 approvals and #5 for volume of I-526 approvals, and also that it is facing a lawsuit by over a hundred unhappy investors in the Battery Maritime Building project. Chen Dongwu et al. v. New York City Regional Center et al. claims that the investors’ “dream turned into a financial nightmare,” with fraudulent misrepresentations and subsequent coverups and fiduciary failures leading up to investors facing the loss of their entire investment. Presumably the investors in this suit received I-526 approval, but USCIS adjudication is only part of EB-5 investment success. I’ll look forward to seeing how New York City Regional Center responds to the allegations, which are a big story since this RC is such a big player in EB-5. At-risk investments inherently risk loss, and some will lose, and loss does not equal fraud. Risk does not equal license to shirk responsibility or deceive investors, however, and the defendants need to explain their side of the story. Future filings for the case can be accessed at the New York State Unified Court System website with Index Number 6520242017. The AAO decision Matter of P-A-K, LLC JUN092017_01K2610 denies motions to reconsider and reopen filed by Path America KingCo regional center. This decision reiterates that termination decisions “take into account a variety of factors, both positive and negative, that encompass past, present, and likely future actions.” But having reviewed new evidence of the RC’s on-going projects, AAO apparently concludes — almost in so many words — that SEC action against a former principal for fraud and mismanagement is the kind of negative that cannot be outweighed by any number of positives in terms of current management and project progress and prospects. I trust that USCIS/AAO thinking will be challenged and will develop more nuance over time. Securities and Exchange Commission v. Seyed Taher Kameli, et al. is a new civil action involving a regional center. The Complaint filed June 22, 2017 alleges that Seyed Taher Kameli and his companies, Chicagoland Foreign Investment Group, LLC and American Enterprise Pioneers, Inc., falsely claimed to foreign investors that their investments would be used to fund an EB-5 qualifying project, but instead diverted millions of dollars to fund other projects, make unrelated payments, and for personal enrichment. As with other SEC actions on EB-5, conflicts of interest are the dominant red flag. The defendant Mr. Kameli controlled the regional center, investment funds, and job-creating enterprises, and also represented many investors as their immigration attorney. This kind of scenario should not be hard for future investors (or even legislators) to avoid. I continue to update my Terminations Log, though USCIS has not yet posted any new letters for terminations since 2016. I’ve started a Termination Log spreadsheet (also linked to my RC List page for ongoing reference) to correlate USCIS’s terminations list with its notices list, and facilitate analysis. Pivot table analysis of this log provides a quick overview of termination reasons (from the 69 termination notices posted so far) and timing. In fact the termination notices are not very informative (most reference Notices of Intent to Terminate, which are not attached, for specific reasons), but we can generally learn that about 77% of RC terminations from 2008 through November 2016 occurred for one of two reasons: failure to file an I-924A annual report, or the fact that the I-924A report reflected inactivity (i.e. no investor petitions in three or more years). Just 12% (notices for eight regional centers) referenced problematic behavior by the regional center as a basis for termination. Other reasons include the regional center’s voluntary request to withdraw from the program. One letter dated July 13, 2016 explains “USCIS notes counsel’s request to withdraw from the program. The mechanism to end a regional center’s designation, whether initiated by the regional center or USCIS, is termination of the designation.” (This particular letter could’ve raised on-going FBI investigation as a termination issue, but that’s another story.) The Final Fee Rule published 10/24/2016 confirms that a regional center may elect to withdraw from the program, but does not offer an exit more dignified than termination. “A regional center may elect to withdraw from the program and request a termination of the regional center designation. The regional center must notify USCIS of such election in the form of a letter or as otherwise requested by USCIS. USCIS will notify the regional center of its decision regarding the withdrawal request in writing.” This is a pity, as the terminated regional center list looks like a walk of shame, and I think voluntarily withdrawal should be treated differently from termination initiated by USCIS. Investors who think they’ve fallen victim to errors by USCIS will be interested in this long but ultimately successful battle by a group of EB-5 investors. 2013-2015: USCIS denies the I-526 petitions, and then denies Motions to Reopen filed by the petitioners. The petitioners appeal the denials to the Administrative Appeals Office. Ronald Fieldstone reflects on a recent China trip in his post EB-5 Marketplace Measurement – China and Beyond (May 25, 2017). We’re reminded of the extent to which demand shapes supply in EB-5 investment. The Kushner Companies EB-5 roadshow in China continues to reverberate, with Senator Grassley mining it for yet another press release, this one calling for investigation of the Chinese agent involved, and its sales claims. (Grassley Seeks Investigation of Companies’ Promises of Green Cards 5/25/2017.) The regional center has protested to journalists that the senator’s allegations are baseless in this case, but all regional centers can take the reminder to double-check what their agents overseas are saying and posting online. Also keep in mind IIUSA’s best practices for engaging with sales intermediaries. Lawyers who deal with overseas agents in EB-5 may be interested in a March 2017 Ethics Opinion by the New York State Bar Association. The opinion discusses conditions under which a lawyer may enter into an arrangement whereby a nonlawyer “foreign migration agent” hires the lawyer on behalf of the client and assists the lawyer in communicating with the client. Cyrus Mehta explores the matter further in his post EB-5 Green Card, Ethics and Trump (May 22, 2017). Lee Francis Cissna, President Trump’s nominee for Director of USCIS, committed to finalizing EB-5 reforms in his Senate Judiciary Committee hearing last week. In other words, new EB-5 regulations are still on the table. Mr. Cissna spent much of the past two years working for Senator Grassley on immigration issues, and reportedly wrote dozens of the letters sent under the senator’s name to Homeland Security officials. This does not bode well for his attitude to immigration generally or EB-5, though he made a nice statement at the hearing. The media is still full of EB-5 stories, but many reports struggle to explain EB-5. Are we selling citizenship? Is this a cash-for-visas program? Why would a luxury project by celebrity New York developers get to benefit from immigrant investment? Strictly speaking, EB-5 is not a visa-for-cash program but a visa-for-employment program. The “EB” in EB-5 stands for Employment Based. While some countries do sell citizenship, Congress took care to set up the US program differently. An EB-5 investor can get conditional permanent residence for making a qualifying investment that will result in creation of at least 10 jobs, and may eventually get a permanent green card if the investor sustains the investment and can go on to demonstrate that jobs were in fact created. Cash alone does not win EB-5 status. Another distinctive feature of the US investor visa program is that it involves private sector investment, not government-sponsored or government-controlled investment opportunities. The prospective immigrant is free to choose to invest in anything from an Iowa farm to a New Jersey skyscraper, and may apply for a visa if job creation and other requirements can be met. Senator Grassley would like the EB-5 investor to chose the Iowa farm, and the investor might prefer it as well if the government bore the risk and responsibility for the choice and replaced market forces in underwriting the investment’s success. The government makes no such offer, however, and the investor is left to decide which private investment opportunity is most suitable. The government influences application of immigrant investor capital in two ways: by defining requirements for EB-5 eligibility, and by offering incentives. An eligible EB-5 investment must be at-risk investment of a certain amount in a for-profit enterprise that creates a certain number and kind of jobs, among other requirements, and the “Targeted Employment Area” incentive with reduced investment was designed to reward investment in high-unemployment and rural areas. For additional reading, see my post with comparison of investor immigration programs worldwide based on a Migration Policy Institute report, and my summary of TEA incentive proposals in proposed regulations and legislation (now significantly revised and expanded, and I welcome additional corrections). Now that we’ve celebrated the good news of regional center program extension to September 30, 2017, here’s some concerning news to keep in focus as well. The regional center program was barely extended – just another few months added. The program desperately needs stability – preferably the stability of a permanent program, and at least the stability we used to have of three-to-five year extensions. These tiny months-long jumps reflect deferred decision-making, not necessarily votes in the program’s favor. We need Congress to take positive action on EB-5 — something it hasn’t done since 2012. Big-city mega-projects are a minority of EB-5 offerings but claim a large number EB-5 investors, and their prominence in the news is not helpful when Congress and the public need to see how EB-5 is also working to help undercapitalized areas. This weekend, media from the Washington Post, the Wall Street Journal, the New York Times, and The Guardian to NPR and Vox.com are reporting hot stories from journalists who persevered in observing an EB-5 roadshow being put on in China by the Kushner Companies. It hardly matters if the backers are completely innocent of influence peddling – indeed, they ought be innocent, because everyone is likely to just assume and act on the assumption that they’re guilty, regardless of what they do or say. Prospective investors are likely to assume without being told that the Kushner EB-5 project promoters can leverage access to power at the highest level, making the offering very attractive, and EB-5 critics will be just as eager to jump to the same conclusion, making the offering very dangerous politically. Senator Grassley, Senator Leahy, and Senator Feinstein at least are going to have a field day. (Updates: Feinstein and Leahy have a letter out to the White House Counsel, Grassley has written a letter to John Kelly, Leahy, Conyers, and Lofgren have written a letter to the Kushner Companies, and the White House has started issuing statements.) Some of my relatives even called me today, questioning my involvement in EB-5 after reading the news. I’m proud of my personal experience with many small businesses that launched thanks to EB-5 investment, with investors who sacrificed to invest and have persevered on a difficult and lengthy path to US residence, and with entrepreneurs who’ve brought so much more to the US than their money. Such stories rarely make the news, however. In reviewing statistics on EB-5 filings for the Notice of Proposed Rulemaking, DHS indicated that regional center projects in FY2013-2015 included 15 investors on average, while non-regional center investments had two investors on average (NPRM footnote 58). That’s just an average, but reflects the EB-5 world I have known best. But mega-projects, though few in number, are increasingly making a big splash in a small pond. The Kushner project reportedly seeks to raise $150M from 300 investors, which means it could claim nearly 10% of available EB-5 visas for a year assuming an average of three visas per investor. The 27 mega-projects summarized by NYU researchers in a March 2016 article would use up over three years of EB-5 visa numbers by themselves, if fully funded. New York City Regional Center recently announced its 1000th I-829 approval, with permanent residence for over 2,750 individuals and conditional permanent residence for an additional 5,200 investors and family members – nearly 8,000 visas facilitated by a single regional center. This big-fish phenomenon is something to grapple with as we contemplate the future of the EB-5 program. Investors understandably gravitate to major-league capitalists when the SEC keeps showing up amateur capitalists. The SEC has announced another EB-5 case, this one involving Serofim Muroff, associated entities through which he allegedly misappropriated funds, and an administrative assistant/bookkeeper charged with facilitating the misappropriation. Here is a link to the SEC press release and complaint. The woes of Idaho State Regional Center are not new (various lawsuits have been ongoing), but this SEC case looks distinctive to me in the way it applies securities laws to the EB-5 context, and I look forward to expert analysis. (UPDATE: see McKee and Ahrenholz: SEC Flexes Enforcement Muscle in EB-5 Action.) The handful of EB-5 cases brought so far by the SEC have common themes that should be targeted by industry best practices and integrity measures in new EB-5 legislation. The news from Charlie Oppenheim during the IIUSA EB-5 Washington, D.C. Conference was predictably sobering. Mr. Oppenheim anticipates that the cutoff date for China-born investors will have advanced only to June or July 2014 by the end of this fiscal year, and to September or October 2014 by the end of next fiscal year. Considering the I-526 filing surges that have happened since 2014, this trend is not going to get prettier, absent legislation to change visa numbers. Mr. Oppenheim also noted that Vietnam could trigger the per-country limit and become subject to a cutoff date in 2019 or 2020. The small-pond phenomenon (only about 10,000 visas available annually for investors plus family members, and 7% per-country limit when the cap is reached) is another important issue for Congress to address as it contemplates the future of the EB-5 program. President Trump, who has yet to exhibit any warm fuzzies to EB-5, despite what the Washington Post may suspect, has appointed a new CIS Ombudsman known for being anti-immigration generally and anti-EB-5 in particular. My only question is whether Julie Kirchner’s probable bad intentions are any more likely to be effective than good intentions expressed by previous Ombudsman. Meanwhile, USCIS continues to approve new regional centers while terminating others for failure to promote economic growth. Additions to the USCIS Regional Center List, 04/17/2017 to 05/08/2017. In his testimony before the House Judiciary Committee in February 2016, Investor Program Office Chief Nicholas Colucci discussed how much USCIS has done to improve its administration of the EB-5 program, with particular focus on adding resources to prevent the kind of fraud and abuse that can come with investment and immigration. Over the past few years, USCIS has taken a number of steps to improve the administration of the EB-5 program. In 2013, USCIS realigned the EB-5 program into the Immigrant Investor Program Office, and relocated it from USCIS’ California Service Center, which adjudicates various immigration benefits, to Washington, D.C., with a Chief dedicated exclusively to EB-5 adjudications. As the United States Government Accountability Office (GAO) noted in its August 2015 report to Congressional requesters on the EB-5 program, this move was part of a restructuring to help USCIS better detect fraud. USCIS also created a Fraud Detection and National Security EB-5 Division (FDNS EB-5) and embedded its personnel within IPO to work alongside adjudications officers. Additionally, a dedicated team of attorneys from the USCIS Office of Chief Counsel advise on program-related legal matters. In staffing the IPO, USCIS has, and continues to invest in the specialties needed to manage the complex EB-5 caseload by hiring staff with expertise in economics, law, business, finance, securities and banking to review cases and to enhance consistency, timeliness, and integrity within the program…. USCIS has taken its responsibility to administer the EB-5 program very earnestly, through its specialized staffing devoted solely to this program and its extensive efforts to regulate the quickly growing regional center program. However, no agency can do this alone. The EB-5 program necessitates collaboration with several other agencies, and the establishment of IPO in Washington, D.C. allows USCIS to work closely with partners such as the U.S. Securities and Exchange Commission (SEC), with whom IPO shares a robust collaborative relationship. USCIS also works closely with its sister agency, U.S. Immigration and Customs Enforcement (ICE), as well as with the Federal Bureau of Investigation (FBI) and the U.S. Department of State, in support of our oversight of the EB-5 program. Matter of S-D-R-C-, ID# 13768 (AAO Mar. 15, 2017) considers the question of whether or how USCIS would be justified in terminating South Dakota International Business Institute — a regional center that on the one hand has had many successful projects and contributed significantly to economic growth over the years, and on the other hand was – for a number of years, though not currently – in the hands of management charged with various improper activities. The AAO concludes, after interesting discussion deserving industry attention and response: “Evidence of a regional center’s improper or unlawful activities is relevant to the question of whether that center is continuing to promote economic growth, but derogatory evidence must be weighed against countervailing equities on a case-by-case basis. This case contains evidence of the diversion of funds away from job-creating activities, as well as evidence of substantial economic activity that created thousands of jobs. USCIS must consider all relevant factors in determining whether the Applicant’s regional center designation should be terminated or maintained.” AAO withdrew USCIS’s termination decision and remands the matter for further proceedings. The SEC has announced fraud charges against Washington-based businessman Andy Shin Fong Chen and his company Aero Space Port International Group, Inc. The complaint has the usual allegations regarding misappropriation of EB-5 investor funds, and is distinctive in targeting just one of the regional center’s several offerings. The RC response argues that the EB-5 investments are not securities (SEC begs to differ), and points out that the investors involved still support the project and its management (unsurprisingly, considering that they have I-526 petitions pending). I haven’t had time to fill out details in my log of SEC EB-5 cases, but hope someone else will publish an exercise like this to highlight common themes. In an article published today in The Hill, Catherine DeBono Holmes discusses reforms that could help reduce or eliminate the factors that keep repeating in the scattered cases of alleged fraud in EB-5. The EB-5 Insights blog reports that that IPO seems to be implementing an undeclared policy of holding I-526 petitions in abeyance when an Exemplar I-924 Petition associated with the same new commercial enterprise has been filed. For reference, here is my running log of communications from USCIS regarding EB-5 petition processing practices and times. My EB-5 discussion forum is still open for investors to discuss their experience and progress of the cases they are tracking. The article Will EB-5 Survive? (February 23, 2017) in National Real Estate Investor reviews the current status of EB-5 politics. 2/6/2017 UPDATE: The news in this post is now all outdated. Please see my Washington Updates page. This week Washington has been busy making good on campaign promises and also throwing babies out with the bathwater. Of most significance for EB-5, the President has frozen federal hiring (halting USCIS plans to deal with petition backlogs and improve processing by bringing on more staff) and created two hurdles for new regulations (a regulatory freeze and a make-one-delete two requirement), deferring hopes and fears for the long-awaited modernization of EB-5 regulations. A horrifying new order suddenly suspends whole countries of people from US visas and even entry based on nationality. Senator Dianne Feinstein decided the time was right put her long-running opposition to EB-5 in the form of a bill (S.232) that proposes eliminating EB-5 entirely, both direct investment and the regional center program. I’ll write more about this bill if anything comes of it, but I expect that that the significant legislation will be a forth-coming update to the Goodlatte EB-5 reform bill (last released 12/2/2016). I am going forward with my work as usual under the assumption that reason will prevail eventually and that immigrant investment and the country generally are not, after all, doomed. But if anyone would like to offer me a chance to move from the immigration business to the walls-and-bunkers business, I’m listening. As EB-5 stakeholders process proposed new EB-5 regulations, they are thinking (1) how can I dissuade USCIS from the changes that would be most harmful for me personally; (2) how can I take best advantage of this golden opportunity to explain to USCIS how EB-5 works in the real world; and (3) how early could the proposed regulations become final, effective regulations? We know at least that regulations can’t proceed to the next step until after the public comment period closes on April 11, 2017, and now the new administration has put another hurdle in the road. President Trump’s first Presidential Memorandum is addressed to the Heads of Executive Departments and Agencies with the subject Regulatory Freeze Pending Review (January 20, 2017). It does not put a moratorium on new federal regulations, but does require that any new or pending regulations be presented for review and approval of a Trump-appointed agency head before proceeding any further. This means that proposed new EB-5 regulations will need to go before General John Kelley, the newly-confirmed Secretary of Homeland Security. Would General Kelley allow new EB-5 regulations to move forward? The tireless Senator Grassley met with General Kelley on January 13, and reported that “In addition, we talked about new proposed regulations published by the Department today that would go a long way to restoring the EB-5 immigrant visa program to the way Congress intended it to be used: to help bring much-needed jobs and capital to rural and economically distressed areas. I [Grassley] expressed my strong desire that these rules be kept in place and allowed to go forward to ensure that this program fulfills its original intent.” I don’t know what input General Kelley may get from other directions, or whether the flood of lobbying dollars out of New York will have an impact. IIUSA indicates that its official comment submission to DHS will seek to demonstrate the negative effects that proposed changes would have on the industry. People drafting new EB-5 regulations and legislation are motivated, in part, to implement reforms that can help preempt the kind of situations that end in SEC action. When cases appear, we have a post-mortem opportunity to consider: what went wrong here, and how might problems have been prevented or at least detected earlier? Last week the SEC published a complaint against San Francisco Regional Center, Thomas Henderson, and related parties. This case has the usual allegations (commingling, misuse, and misappropriation of funds), but offers a relatively challenging “what-if” analysis. The regional center’s website and offering documents (as quoted in the suit) appear to make all the right representations about account transparency; it just happens that the RC apparently didn’t follow through on these representations, and a third-party co-owner with apparently every right and motivation to monitor proper use of funds had to resort to a lawsuit to claim his right to oversight and eventually apply the breaks. Retrospective armchair due diligence isn’t as easy for this case as for some others. I wonder – what different policy or different industry practices could have contributed to improved policing in this situation? Additions to the USCIS Regional Center List, 11/29/2016 to 12/06/2016. New Policy: Effective November 30, 2016, USCIS replaced all existing EB-5 policy with a new Policy Manual: USCIS Policy Manual, 6 USCIS-PM G (November 30, 2016). This major event puts the whole program on a new footing (though 6 USCIS-PM G is essentially similar to the policy it replaced, with a few adjustments, additions, omissions, and clarifications as I started to discuss here). Proposed New Regulations: As I announced this week, USCIS has published notices of proposed EB-5 rule-making in the Federal Register. Advance Notice #0008 invites stakeholders to give input on possible changes to regional center designations and terminations and the I-924 and project approval process. Notice #0006 gives proposed new rules covering priority dates, investment amounts, and TEA designation, among other things. If the new rules are finalized as proposed, the EB-5 minimum investment amount will increase to $1.8 million (or $1.35 million within a TEA) as calculated from inflation, fewer projects will qualify for TEA status, investors with approved I-526 will have the option to invest in a different project without losing their original priority date, and regional centers may need to get project approval before offering investments. We can expect action toward finalizing regulations at some point after the public comment period closes on April 11, 2017 – maybe shortly or maybe long after, if the comments inspire redrafting and/or if the new administration chooses not to greenlight the regulations. Proposed New Legislation: Congress was (reportedly) actively working on EB-5 reform legislation before the continuing resolution that passed on December 10 provided the regional center program with a clean extension through April 28, 2017. We have a staff draft of an EB-5 bill dated December 2, 2016, and understand that staffers and lobbyists are still working with this document behind the scenes. If the staff draft were passed as-is, the EB-5 minimum investment amount would decrease to $700,000 (or $650,000 for a TEA investment), with incremental increases up to $1M/$800K, additional TEA categories and incentives (including rolling visa set-asides) would be introduced, and regional centers would be given hefty new annual fees ($10,000 or $20,000) and relatively gentle new fund administration and reporting requirements. (My bill comparison chart gives a link to the bill text and summarizes the provisions.) We may see action toward passing reform legislation in the coming months before the next regional center sunset date on April 28 – or may not, with so many other matters demanding attention during Trump’s first 100 days in office, and the anti-change lobby. New Data and Statistics: We got updated numbers from USCIS and the Department of State on EB-5 petition and visa processing and backlogs as of the end of 2016. The numbers show a queue of current and prospective visa applicants about 75,000 people long, which implies an 8-year visa wait for new China-born investors. And unless USCIS improves processing volumes, it will take 2+ years just to process the currently-pending I-526 petitions and 3+ years to just process the currently-pending I-829 petitions. Proposed EB-5 reform legislation and regulations both plan to improve processing times/volumes, but do not offer to increase available visa numbers. Fee Increases: EB-5 petitions and applications have higher filing fees since December 23, 2016. The new I-924 fee (dramatically increased to $17,785) is likely to curb the burgeoning number of regional centers (perhaps especially new applications from serial operators, which have accounted for an increasing percentage of new RCs) and discourage voluntary filing of amendments. Department of Commerce EB-5 Impact Analysis: We finally have the long-promised Department of Commerce study commissioned by USCIS: Estimating the Investment and Job Creation Impact of the EB-5 Program (January 2017). The product is a slender report and based on old data from 2012-2013, so the numerical conclusions are of limited interest at this point, but the analysis is still significant and could have political impact. I can see EB-5-critic Senator Grassley seizing on this report and the barriers to good analysis that the authors describe. EB-5 economists should review the formerly common EIR problems identified on p. 9, and ensure that they’re not still repeating them. New AAO Decisions: In November and December, USCIS published 27 new decisions on I-526 cases and one new decision on a regional center termination appeal. The termination decision (NOV022016_01K2610) and 15 nearly-identical I-526 decisions (for example DEC142016_07B7203) are related to Path America KingCo, LLC, which lost designation after an SEC action mainly targeting its principal. The regional center appealed its termination based on pursuing active, viable projects under reputable new management. Investors appealed with the argument that their petition denials were premature, coming while the regional center appeal and the SEC case were still unresolved. AAO found that the investor appeals were hopeless due to the issue of material change, and that the regional center appeal was not sufficiently compelling. (But the RC decision interestingly grants the possibility that mitigating, corrective, and restorative actions could potentially compensate for past problems with the regional center or related entities.) Among decisions not related to Path America, I hope to write more about three decisions with good discussion of material change issues (NOV012016_02B7203, NOV072016_01B7203, NOV292016_02B7203) and two that address the level of business activity necessary before filing I-526 (NOV092016_01B7203, NOV292016_01B7203). I’ll particularly highlight NOV292016_01B7203, which explicitly states what I’ve always said – that an investor must not file a TEA-based I-526 before securing a location for the business. New SEC Actions: On December 27, 2016, the SEC published a complaint brought against California-based attorney Emilio Francisco and associated companies who are charged with diverting and stealing EB-5 investor funds. On December 28, 2016, the SEC announced settlement on a case against AJN Investments LLC/Jason Adam Ogden, who was charged with diverting EB-5 investor funds and wrongly making midstream business model changes. I’m interested to note that these SEC complaints do not implicate or even identify the regional centers that sponsored the EB-5 investments involved. The SEC holds the project companies and principals exclusively responsible for problems in the offerings, projects, and use of funds. I wonder whether USCIS will pursue the regional center sponsors, holding them responsible for oversight, or whether it will follow the SEC’s lead in considering the sponsors out of the picture. It appears that the regional centers in these cases did not control any NCE bank accounts and were not involved in offering documents or investor promotion. In other news, the SEC has just settled with Path America (a case that did implicate the regional center). Other litigation: On November 14, 2016, a long list of EB-5 investor plaintiffs brought a civil suit against a long list of defendants associated with the Palm House Hotel EB-5 project. The suit enumerates the lies that the investors believe they were told, calls out every party and service provider allegedly involved in making false representations, and traces alleged misuse of investor funds. The case appears complicated and ambiguous (not the kind of low-hanging fruit that the SEC seems to favor) but full of drama and makes for gripping reading. Another case that’s older now (filed August 2016), but also a colorful Florida story: USA v. Karamchand Doobay, who was charged with perpetrating fraud through his regional center and projects. I’m sure the investors in these cases would unite in one message for the future: do not neglect due diligence before investing! And the defendants would likely encourage care in partnerships and representations. Good news: Meanwhile, just to keep perspective, 99% of the 865 regional centers are apparently doing well and good, or avoiding lawsuits and bad press at any rate. At least $10.4 billion dollars of EB-5 investment entered the U.S. economy in 2016, judging by the number of I-526 petitions filed during the year. I was privileged to write business plans last year for 32 new EB-5 deals that look promising for both local communities and foreign investors, and I continue to be encouraged by what I see on the ground on the bright side of EB-5. Last December, the Securities and Exchange Commission made examples of several parties (mostly immigration lawyers) found to have violated Section 15(a)(1) of the Exchange Act by acting as unregistered broker-dealers: helping to effect securities purchases in an EB-5 Regional Center, and receiving a commission for each investment they facilitated. Each respondent was ordered to disgorge the fees and interest plus pay a $25,000 fine. (If you’d like to be reminded of the circumstances, you can read the Cease and Desist orders for Bernstein, Wang, Manesh, Khorrami, Kaye, Bander, and Azarmehr). These actions reiterate the message that it’s wrong to act as an unregistered broker dealer. It’s equally impermissible to to pay an unregistered broker-dealer, and the SEC has picked a high-profile target to drive this point home: American Life, which must now pay a civil penalty of one million dollars for transaction-based compensation paid to certain EB-5 agents from 2011 to 2014. American Life has brought in more EB-5 investment and completed more good EB-5 projects than almost any other regional center in history, but the SEC found that it also wrongly “paid or caused to be paid transaction-based compensation to certain domestic EB-5 agents in connection with EB-5 securities, which caused those EB-5 agents’ violations of Section 15(a)(1) of the Exchange Act.” Pay attention, Regional Centers, to this warning shot! To avoid million dollar penalties of your own, be extremely careful about who acts as a finder for your investors, and how. If an immigration lawyer offers to help introduce investors, and expects be compensated accordingly, just say no! You may want to review IIUSA’s Best Practices for Engaging With Intermediaries. You can now review video of the 4/13 hearing on EB-5 targeted employment areas on the Senate Judiciary Committee website (be patient, the video does start eventually), or download my audio recording. My main take-away from the hearing is that Senate leaders are on a long-term path to EB-5 reform and Regional Center reauthorization. They discussed very substantive potential changes in a very preliminary manner and sounded no-where near ready to sit down and agree on legislation. This is worrisome, considering that only a handful of Congress workdays remain before the 9/30/2016 Regional Center sunset date (what with conventions and vacation and holidays) – hardly enough time to hammer out the issues and questions that this hearing raised as important. The TEA issue is a thorny one because it comes down to a question of what kind of projects Congress wants to see incentivized, and our representatives don’t agree about that, much less on the question of what type and method of incentive would effectively focus on such projects. Listening to Gary Friedland testify at the Senate Hearing reminded me that I’ve been remiss in reporting on the latest EB-5 research that Mr. Friedland and Professor Calderon have posted at the NYU Center for Real Estate Finance Research. Their paper EB-5 Mezzanine Financing: A Real World Example (3/23/2016) presents and analyzes an actual term sheet for a large EB-5 regional center deal, and will be very interesting for people seeking examples of EB-5 documents and deal terms. EB-5 Capital Project Database: Revisited and Expanded (3/29/16) follows up on last year’s paper A Roadmap to the Use of EB-5 Capital: An Alternative Financing Tool for Commercial Real Estate Projects (5/24/2015) by adding details of 27 additional EB-5 projects. The number 27 is small – representing a minority of EB-5 projects – and yet these few projects alone involve over $5.6 billion in EB-5 capital, which means over 11,000 EB-5 investors and almost three years of the total EB-5 visas available. I have to hope that Senators and journalists don’t examine the NYU database, because these few projects claiming so many dollars and visas could provide ammunition for criticism that EB-5 TEA investments have become a subsidy for luxury developments in tier one cities, a benefit for mega-developers and Chinese developers, an opportunity to replace existing financing rather than a source of needed capital, and a minor contribution to job creation. As a business plan writer I work with EB-5 projects that could be attractive poster children for the regional center program, but such modest projects usually don’t make the research papers or the news and their fate may depend on how the big players are seen to use EB-5. Also in the category of the last thing we need when facing a fight for Regional Center reauthorization: a venerable figure in the RC program is now subject of fraud charges and an asset freeze. According to today’s press release: SEC Case Freezes Assets of Ski Resort Steeped in Fraudulent EB-5 Offerings. The State of Vermont has filed a concurrent suit. The SEC Complaint does not name Vermont Regional Center, but it does call out Ariel Quiros, William Stenger, and a whole list of Jay Peak companies. I read the SEC complaint ready to make allowances, since I know that in real life it’s extremely difficult to produce documents that are completely free from omissions and misleading statements or that perfectly anticipate what subsequently happens, and I think one should be very hesitant to cry fraud. Sadly the SEC complaint leaves little room for charitable interpretation, and this situation looks like a mess likely to pass beyond Jay Peak and their investors to leaders who have been regional center program champions. Senator Leahy concluded his comments on the enforcement action by saying: “Given the significant problems plaguing this program, I will continue to push for meaningful reform. Without reform, I believe the time has come for the program to end.” Hurry up, reformers! We are now less than a month from December 12, when the Regional Center program will sunset if it doesn’t get another reauthorization. It’s possible that the program could get temporarily extended as part of the appropriations bill that also needs to get passed by December 11 (which would mean extension with no change through 9/30/2016), or there might be stand-alone legislation with some significant changes and reform as well as reauthorization, or our representatives might let the program lapse for a while because they haven’t worked out appropriate legislation in time but don’t want to see simple extension. Grassley, Corker, and Johnson sent a letter on 11/6 to Senate leadership saying that they oppose a straight reauthorization of the EB-5 Regional Center program in the anticipated appropriations bill that will cover fiscal year 2016, and advocate instead to continue the program together with measures to increase accountability and better guard against fraud and abuse. We wish they would hustle to formulate such measures. Grassley and Leahy have been quietly circulating a revised draft of S. 1501 (IIUSA has a copy, as do select real estate industry executives according to the Wall Street Journal Washington Wire blog). I’ve read the draft but decided not to comment here until it gets officially proposed. The new draft is significantly clarified and toned down from the original bill, though still a game-changer. But will passable legislation be proposed in time to make any difference? If only Washington worked more efficiently! I appreciated the article “EB-5 Due Diligence Matters” (November 3, 2015) by Douglas Hauer, John Nucci, and Peter Saparoff of Mintz Levin. The authors discuss the legal requirements for due diligence investigations and give practice pointers. Today Congress passed a short-term spending bill that keeps the government running through December 11, 2015, and, among other incidentals, the EB-5 Regional Center program running without changes for the same period. The President is expected to sign later tonight, so I trust that this post is not premature. IIUSA has already made a statement. Recommendation 1: Update standards for the EB-5 Program. By enhancing program integrity and updating eligibility requirements, this program can better serve our nation. DHS intends to pursue rulemaking to achieve those goals, including by requiring conflict-of-interest disclosures by Regional Center principals, enhancing background checks and public disclosure requirements, and increasing the minimum qualifying level of investment. DHS will also take steps to improve the adjudication and approval of Regional Center applications. Recommendation 2: Clarify options for potential EB-5 investors to obtain visitor visas. State will amend its guidance in the Foreign Affairs Manual to clarify that potential EB-5 investors can obtain visitor visas to examine or monitor potential qualifying investments if they otherwise qualify for the visitor visa. People preparing to file the Form I-829 should keep in mind that USCIS has posted a new version with significant updates that particularly affect Regional Center investors. An EB-5 Insights blog post summarizes the changes. The CIS Ombudsman’s 2015 Annual Report to Congress, has a section on the EB-5 program, including this sobering chart.